« Britain’s happiest places mapped – complaining makes it worse! Ginkgo biloba …what is it good for? Interestingly the UK’s Advertising Standards Authority (ASA) tells me that they have, “… accepted that this particular product can, in the short term, help with the maintenance of memory in healthy individuals.” This acceptance seems, to me to extend beyond the “age decline” claim of Holland and Barrett. 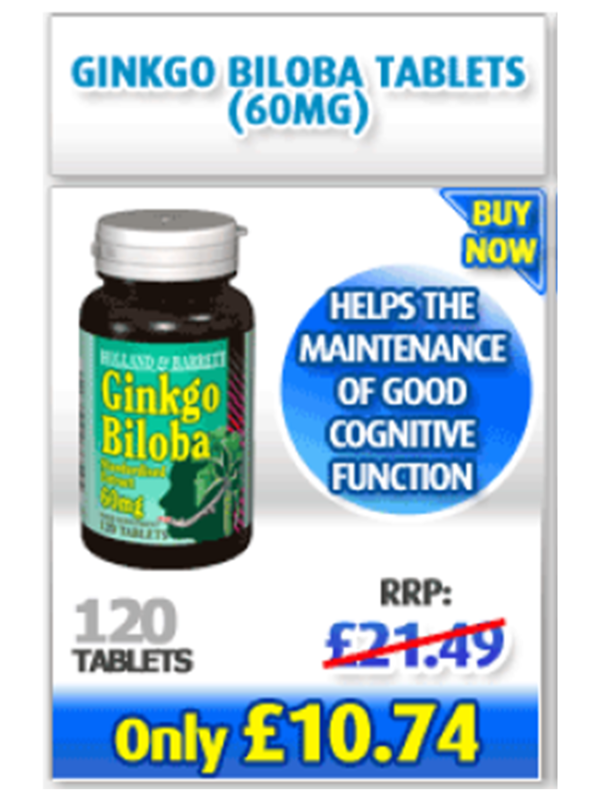 So, curious about the evidence, I decided to search for something to convince me that Ginkgo Biloba supports the, “maintenance of good cognitive function” or, “memory in healthy individuals”. As always, my first port of call was the respected Cochrane Library. I searched this resource for “Ginkgo Biloba” and found only one potentially relevant Cochrane review. As it is, this looks at the effects of this herb on people with dementia, rather than the general population that the ASA are happy to accept can be helped. Birks J, Grimley Evans J. Ginkgo biloba for cognitive impairment and dementia. Cochrane Database of Systematic Reviews 2007, Issue 2. Art. No. : CD003120. DOI: 10.1002/14651858.CD003120.pub2. There is no convincing evidence that Ginkgo biloba is efficacious for dementia and cognitive impairment. Overall, evidence that Ginkgo has predictable and clinically significant benefit for people with dementia or cognitive impairment is inconsistent and unconvincing. Two of the best most recent trials, which are also among the largest trials, found no difference between placebo and Ginkgo. This is a familiar theme when dealing with CAM: the better the trial the less positive the result. My search did turn up some other reviews. Oken B S,Storzbach D M,Kaye J A.The efficacy of Ginkgo biloba on cognitive function in Alzheimer disease. Archives of Neurology.1998;55(11):1409-1415. “The quality of the included studies was not assessed and the authors have not reported on how the articles were selected, or how many of the reviewers were involved in the data extraction. Each Holland and Barrett pill contains, according to the label (see below), a dose of 60 mg Ginkgo Biloba leaf Extract (Standardised for a minimum of 24% Ginkgo Flavone Glycosides, 14.4mg and 6% terpenes, 3.6mg). The dosage directions on the label are, “Take one or two tablets daily, preferably with meals. Do not exceed stated dose.” This is recommending a maximum daily intake of 120 mg, which would seem to make the effectiveness of this product marginal, even in the sub-group of people who may benefit; if efficacy can be inferred from this study. Ernst E,Pittler M H.Ginkgo biloba for dementia: a systematic review of double-blind, placebo-controlled trials. Clinical Drug Investigation.1999;17(4):301-308. The majority of randomised controlled trials available to date support the notion that Ginkgo biloba is efficacious in delaying the clinical deterioration of patients with dementia or in bringing about symptomatic improvement. Unfortunately none of the current studies is flawless and ultimately convincing. A similar observation can be made about the dosage recommended for the Holland and Barrett product (120 mg daily maximum) and the dosage for which this study provides at least some evidence of efficacy: 240 mg orally for people with dementia. The trial referenced seems to be Hartley et al. “Effects on cognition and mood in postmenopausal women of 1-week treatment with Ginkgo biloba.” Pharmacol Biochem Behav. 2003 Jun;75(3):711-20. What the RCN document fails to mention is that this was a one week trial with only 31 subjects. It also used 120 mg/day of Ginkgo: the maximum dose Holland and Barrett direct. And this was only one of, what appears to be eight outcomes measured. So, in the end: no evidence for improvement of memory in this population. This is a series of small studies with inconsistent results. The initial study showed benefits for, “…non-verbal memory and sustained attention …” whilst the follow-up trial showed significant benefit for, “mental flexibility” only. Looking at Bandolier, in 1995 it commented favourably on this herb, but only for people with specific medical conditions, “The main indications for gingko are peripheral vascular disease such as intermittent claudication and “cerebellar insufficiency“. This latter is an imprecise term that describes a collection of symptoms, especially in elderly people.” This is not evidence for the improvement of cognitive function or memory in healthy individuals. On a positive note, Singh and Ernst also judge that there is “good” evidence for the efficacy of Ginkgo for, “dementia, poor circulation in the leg.” [Trick or Treatment, p.203]. P R Solomon et al. “Ginkgo for memory enhancement: a randomized controlled trial.” JAMA 288 (2002) 835-840. This was a six-week randomized, double-blind, placebo-controlled, parallel-group trial testing an over the counter supplement. The participants were, “randomly assigned to receive ginkgo, 40 mg 3 times per day (n = 115), or matching placebo (n = 115). ” This is the upper limit of the directed dose for the Holland and Barrett product. At 230 participants, this is one of the larger trials I’ve found. Of these 88% (203) completed the trial. However, this is not a field in which I have any particular knowledge or skills: I could be wrong. I have written to the ASA asking them to tell me what evidence their view is based on – I await their reply with interest! This entry was posted on November 16, 2008 at 14:02	and is filed under Supplements. Tagged: Advertising Standards Authority, ASA, brain supplements, cognitive function, Ginkgo Biloba, Herbalism, Holland & Barrett, memory. You can follow any responses to this entry through the RSS 2.0 feed. Both comments and pings are currently closed. I’m surprised at your restraint in not completing the famous song lyric alluded to in your title, AP. While it might not be strictly 100% accurate for Gingko, it seems to be getting prophetically close. And a lot closer than Mr Holland and Mr Barrett. draust: Thought you might like the allusion; I decided to err on the side of understatement. I find that remembering how the hell you’re meant to spell this herb does aid my memory. It is an interesting dilemma for the ASA. They may carry out a review of the literature one year and judge that a product is making reasonable claims. However, some time later, with more evidence (direct or indirect), it seems that the evidence really isn’t that strong – do they have any obligation to review the situation on a regular basis or just to respond to requests that they should? dvnutrix: That’s an interesting point. It looks like the Cochrane review has been re-issued with a less positive assessment than it had originally. Then the 2007 revision, “There is no convincing evidence that Ginkgo biloba is efficacious for dementia and cognitive impairment” (as cited). I wonder if it shows the dangers of accepting too low a standard of evidence to support the recommendadtion of a product to the general public. From what I’ve read I don’t see even the positive trials being large enough and of sufficient quality for that. Perhaps part of the classic double standard in the burden of proof required for alternative and conventional therapies? Anyway, I’ll see what they have to say and perhaps suggest that they review their position. Sadly, another RCT with Gingko has been reported, and it doesn’t prevent the onset of Alzheimer’s Disease: Ginkgo biloba for Prevention of Dementia. In this study, G biloba at 120 mg twice a day was not effective in reducing either the overall incidence rate of dementia or AD incidence in elderly individuals with normal cognition or those with MCI. It would be fabulous if there were a simple intervention that would block the onset of such a cruel disease, but it looks as if Gingko isn’t that intervenion (not that anything else is as yet). dvnutrix: Thanks for the reference and the astute comment. It looks like a pretty sound study. As you say, it’d be great if things were different!